I made this ice cream in honor of my cousin and her fiancee when they came to visit. I really had no excuse other than that. That, and everyone agrees it tastes fabulous. How fabulous? It’s quite possibly the best ice cream I’ve ever made. Heat the sugar in a thick-bottomed pot, until it begins to melt, but don’t let it burn. Add the butter and the banana. Cook until the banana is falling apart, and the mixture is relatively smooth. Make sure there are no solid chunks of sugar (they should melt as you continue cooking). Add the vanilla and about 1/4 cup of milk; at this point, you can set aside a quarter of the banana mixture to add at the end in order to make a swirl pattern. Add the rest of the milk to the remaining banana, and let cool. 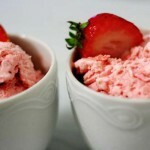 Add the cream and prepare in your ice cream maker, according to the instructions. When the ice cream looks done, add the chopped pecans, and let the machine run until they’re fully integrated into the ice cream. As you’re spooning the ice cream out of the machine and into a container, mix in the rest of the banana. Put into the freezer to harden. 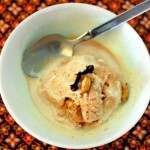 4 Responses to "Banana pecan ice cream"
Your recipes and photos are wonderful. Way beyond my efforts with ice cream, especially innovation & presentation…but on the other hand, we haven’t yet compared taste and mouthfeel. Any time you come to London, be my guest. Do you use a macro lens to photograph your food? If the quality of the photos is anything to go by, the food must taste heavenly. I’d like to know more about your photo setup. Have you worked with any non-sorbet coconut ices? I’ve got a charoset ice which I do in both dairy and in a coconut base for when I take it to meaty meals I’m invited to. But the coconut ice is too hard and lacking in creaminess for my liking. I work with a Canon Digital Rebel XT and a 35 mm lens that goes down to 2.0 f. This lets me get a very narrow plane of focus, and it is capable of focusing at relatively short distances. Other than that, the other major thing that contributes to my photography is setting the white balance. I use the camera’s custom white balance feature if I’m not photographing in daylight (the camera handles daylight pretty well on its own). That’s really it, besides choosing nice dishes and an appropriate background. What do you mean by non-sorbet coconut ices? I was pretty satisfied with the results when I made coconut-based vegan ice cream; it came out relatively light but not too hard. If you’re trying to get something softer, maybe try making a coconut cream-based custard with egg yolks? I’ve never tried it, but that might give you a creamier texture. 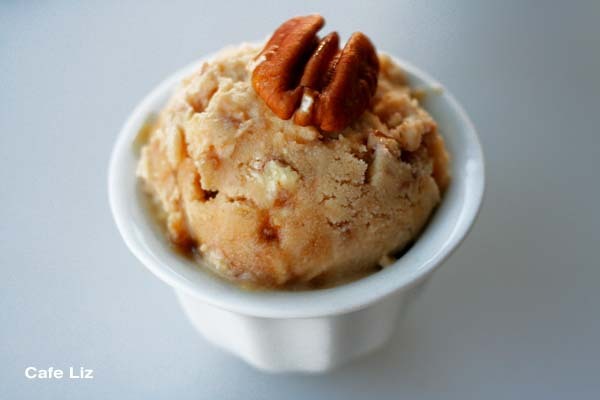 Funny, I’m working on a charoset ice cream for the holiday, too …. I’ve been thinking about trying egg white in the custard too. I used some coconut cream last year–but it didn’t produce quite the effect I was hoping for. And I make my own coconut milk and cream, because there’s no kosher l’pesach coconut milk to be had in London. 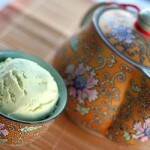 This is my post on making charoset ice cream. I’ve never tried adding egg whites to my ice cream (haven’t found a pasteurized version around here) but that could be a good idea. And since you’re making your own coconut cream, you can control the amount of water you add — I thought my sorbets with coconut cream and no water had a very nice texture, but it could be a matter of taste.